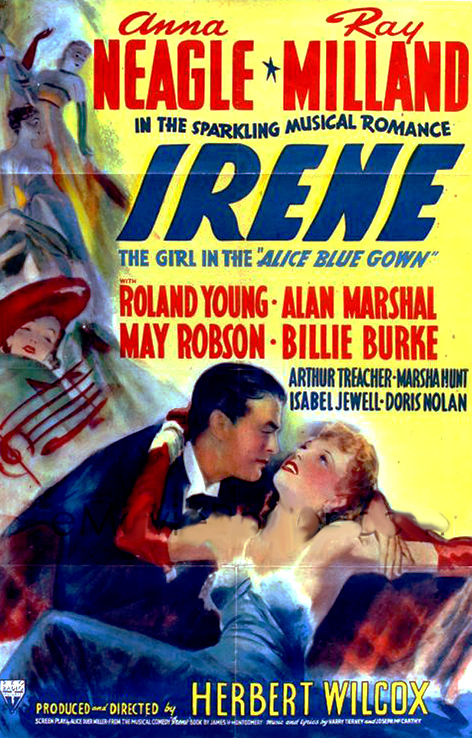 I Is For… IRENE (1919) | THAT'S ENTERTAINMENT! 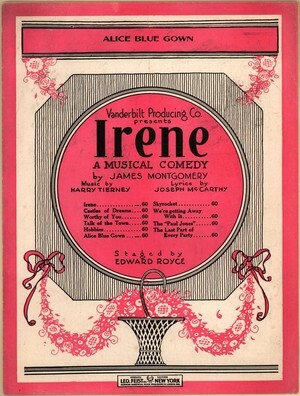 The earliest musical comedy we’ve yet to feature in its own post, Irene has the distinction of being the longest running musical from the first third of the 20th century and is responsible for establishing (in full force) the “Cinderella story” template of which many shows (including 1920’s Sally, which we’ve covered) would take advantage. The story tells of a young working Irish girl, the eponymous Irene O’Dare, who meets and falls in love with a tycoon. She becomes a famous model under an elegant alias and endures romantic drama until things end happily by the final curtain. 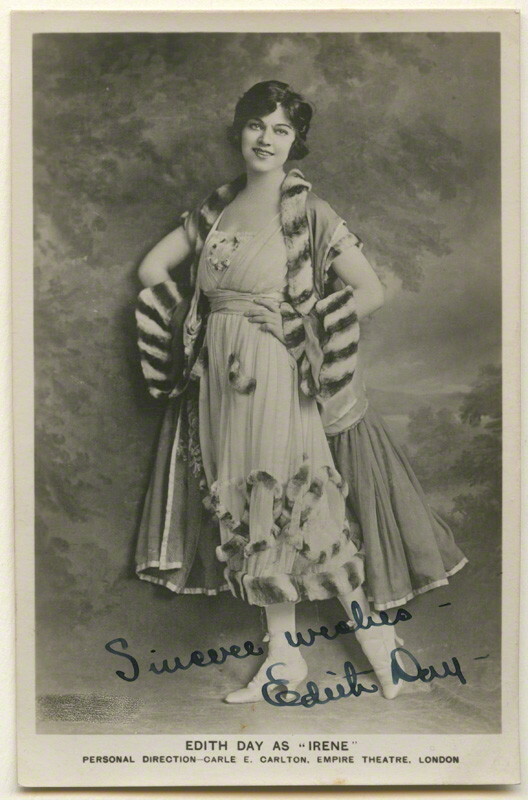 The score by Harry Tierney and Joseph McCarthy is, much like Kern’s Sally, not exceptional; the show’s treasure is its naive charm, and what Miller was to Ziegfeld, Edith Day was to Irene. In fact, she found such success in the Original Broadway Production that she headlined the show’s 1920 Original London Production. 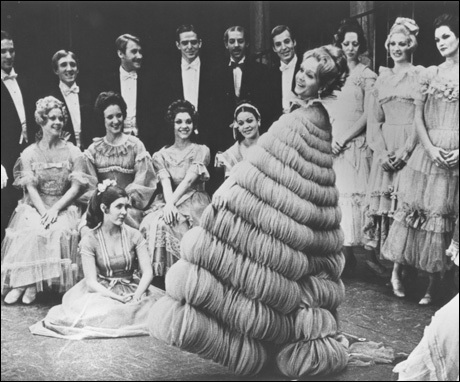 Edith Day recorded Irene’s first number, and the show’s most lasting tune, “Alice Blue Gown,” shortly after the opening. Hear that above. (Note that is also one of a few of the original numbers to be included in Rigby’s revival.) Below, is Day’s recording of “Castle Of Dreams,” included among the cast recordings of the Original London Production. (Although Day’s titular character did not sing this song in the show.) The song enjoyed a slight vogue after inclusion in the 1940 film adaptation. Here’s “The Talk Of The Town,” an utterly delightful number sung by Robert Hale, Winnie Collins, and Margaret Campbell, as Madame Lucy and two of his models, which has only been recorded by the Original London cast. Admittedly, however, I prefer the ’76 London Cast Recording to the ’73 Broadway Cast Recording. So, here’s “We’re Getting Away With It,” sung by the cast of the 1976 London Revival. Also from the ’76 revival recording, here’s the infectious title tune. Come back next Monday for J! And tune in tomorrow for more MTM! Saw Irene in 1973. It was very good. There was a song titled What do you wanna make those eyes at me for , when they don’t mean what they say. that was not from the original show. I enjoyed this song very much. Debbie Reynolds was really good in the show. I have a video copy of the show using the old script and song arrangements . Thanks again and keep those old shows rolling out. Bob K.
Although I do enjoy the ’73 recording, I think one of primary reasons that the revisal of IRENE did not replicate the critical success of the ’71 revisal of NO, NO, NANETTE is that the latter didn’t feature any tunes not utilized within the original production. This fidelity to the source material made for a much more fluid and cohesive production. The new IRENE was all over the place.